A handsome parquet floor, composed of large, polished planks that form an interweaving diamond pattern, a simple but tasteful brass chandelier, and well-judged sprinklings of Regency furniture make a favorable impression as one takes his or her seat for Samantha Bellomo’s production of “Pride and Prejudice” at People’s Light and Theatre Company. Yoshinori Tanokura’s gorgeous set, suggestive of stately ballrooms but equally useful for parkland that boasts lovely views, as represented the watercolorish painting of a country manor and surrounding wall that graces the stage’s eastern wall, only presages the resplendence of the production to come, as Bellomo and company deliver a witty, well-scripted, shrewdly acted theater rendition of Jane Austen’s celebrated novel that celebrated its bicentennial in 2013 and has led to a spate of Austen-mania throughout this theater season. Joseph Hanreddy and J.R. Sullivan, in adapting Austen’s work, fair game for all dramatists since it’s sans copyright and in public domain, capture the tone of the master herself. 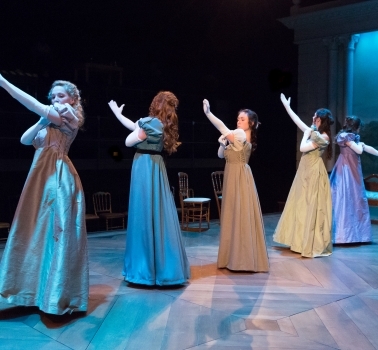 They have a sure sense of Austen’s style and of how to bring the dialogue she presents literarily to the stage as natural conversation and comment. Hanreddy and Sullivan’s is the smartest script I’ve encountered yet in an Austen adaptation. It is less formal and text-bound than the Jon Jory version of “Pride and Prejudice” that was done twice in the last year. Jory’s work was laudable and serviceable — Hedgerow Theatre made fine work of it in a production directed by Jared Reed. — but it didn’t have the easy zest and felicitous grace of Hanreddy and Sullivan’s achievement, next to which Jory’s seems a tad stodgy. Bellomo capitalizes on Hanreddy and Sullivan’s freer form by eliding scenes in a way that is seamless and almost cinematic in approach. She has characters walking on and beginning their sequence as other characters are marching off. Or she has characters in consecutive scenes starting their exit before having them turn and proceed with the new passage. In addition to being creative and efficient, the constant action takes away any need for blackouts — Even the set is changed as part of a parade that blends one scene with its successor. — and makes for a smooth, fluid production in which everything glides elegantly into place so Austen’s timeless story seems of one piece, both uncluttered and uninterrupted in way that makes the narrative stronger and more involving. Perhaps what I admire most about Hanreddy and Sullivan’s script is also a bonus to Bellomo. The playwrights let dialogue do all of the work. They resist what I consider the bane of much theater writing today, a narrator. Characters tell the story in a theatrical, dramatic way. Hanreddy and Sullivan and shrewd and kind enough to realize that in a play, we should not need someone telling us things that rightfully should be put into scene form and acted. Losing the narrator allows for scenes to elide in to one another gracefully. You don’t have that interruption of someone nattering to you something a decent playwright should have the skill to dramatize. I will not say narrators have not been useful or charming, e.g. Salieri in “Amadeus,” but for the most part, their presence is a sign of laziness and lack of craft. And don’t get me started on the gratuitous or self-conscious removal of the fourth wall. My rant on that would keep you reading for months! Hanreddy and Sullivan do not saddle Bellomo with writer’s expediencies, so she and her production are free to present a world that goes on organically and is, in all ways, palpable and authentic. Austen’s story has become the archetype for many novels, movies, and plays of the last two centuries. It is about two people, one governed by pride engendered by social position, breeding, and intellectual disdain of imperfection, the other led by prejudice that often causes her to arrive at conclusions without knowing the facts. Both characters are diffident, unimpressed by the polite mores and formal rituals that surround them. Both think highly of themselves, and both begin their acquaintance as enemies of sorts, pride bowing before prejudice where human affection is concerned. Elizabeth Bennet and Mr. Darcy are the superior people of “Pride and Prejudice.” They are individualists at a time when so many factors, such as family ties and behavior, financial standing, and accidents of birth, could be used to decide what one could expect from his or her life. As individuals, they clash. They also, at a different rate of recognition, realize the depth and worth of the other’s character. It takes them beyond the conventions of 1813 England, conventions that are put into perspective by Elizabeth and Darcy’s relationship and eventual love. We don’t have to glean those conventions. Hanreddy and Sullivan are astute at allowing various characters to delineate them for us. Mrs. Bennet, Elizabeth’s mother, speaks about marriage and financial future and how important it is to get her five daughters married well. Elizabeth tells us Austen’s famous opening line of “Pride and Prejudice” that makes it clear that when a single man of good fortune moves into a neighborhood, he must be looking for a wife. Several characters from Mr. Collins to Lady Catherine de Burgh to Mr. Bennet comment on how the impression one member of a family makes can influence the status of the entire family. Mrs. Bennet’s lower class ways and Lydia Bennet’s unfortunate elopement are two examples of calamity that threatens to ruin a family in “decent” society. Bellomo’s production brings all of this to light (people’s light?) and more. The world including and encompassing the Bennets is presented with depth, dimension, and abundances of cleverness and charm. As the cast gathers on Tanokura’s set, the characters busying themselves in various ways, Marcia Saunders, as Mrs. Bennet, rushes on to announce a neighboring estate, three miles to the north, has been let, at last, to an eligible bachelor. Saunders shows Mrs. Bennet’s excitement and also the loud, enthusiastic, housewifely tones or which others criticize her, but she in no way parodies a style of acting or characterization. She is a flesh-and-blood Mrs. Bennet, and the tone for the comedy in Bellomo’s production are set. Tom Teti, as acerbic and condescendingly responsive to his wife as Austen creates him to be, provides great counterpoint to Saunders and indeed to anyone who is fatuous, exaggerating, or silly in his presence. The two masters, both People’s Light veterans, are at the top of their game. Bellomo also defines the five Bennet sisters well. You immediately see Jane’s demureness and beauty in Jessica Bedford, who, like Scallen, is playing this role for the second time this year. Elizabeth, a little less cosmetic or meticulous than Jane, is also shown, in the person of Julianna Zinkel, of having a fine, disciplined intellect. From early glances, you know that she is a keen observer and strict judge of all that happened around her and that her superiority is tempered by a strong sense of humor and her father’s ability to express succinctly what is on her mind. Emiley Kiser shows Lydia’s love for military men and millenary anything within seconds of her entrance. Clare Mahoney establishes a nice running bit that has her nodding at everything Lydia says. The nod carries over to Kitty’s response other characters as well. The mise en scene takes immediately form. As the production slides into the first ball at which the Bennet sisters see Mr. Bingley, for whom many mothers in Hertfordshire have set their daughters’ cap, and the unsociable Mr. Darcy, the audience is already deeply engaged and anticipatory. Bellomo directs some nice touches for this first ballroom scene. She cleverly has Elizabeth whisper what she’s overheard Bingley and Darcy say into Mrs. Bennet’s ear, thus giving the mother some provocation for one of her outbursts. She and Lamm conspire to have most of what Miss Bingley says take the form of a double entendre, polite and proper on the outside, venomous and contemptuous in context. Lamm is wonderful as plying this double-edge verbal sword. She captures Caroline Bingley the best of any actress I’ve seen portray her. Mark LeVasseur is a remarkable Darcy. He plays the character’s actual and self-imposed superiority well, keeping to himself and looking bored to the point of distraction at the ball. LeVasseur is properly subtle in the way he has Darcy notice and watch Elizabeth and in his early conversational approaches to her. The actor never falters in conveying his character’s mood and attitude. He has the discipline to let you see Darcy change. The softening in facial expression and posture when Darcy finds Elizabeth visiting Pemberley as a tourist, is perfect. His tones of voice and reactions to Elizabeth are no less astute or on the mark. LeVasseur embodies Darcy totally. Because of that, he is charismatic and romantic. LeVasseur plays the untouchable, unimpressed man so well, yet there is always that glint in his eye when he pays surreptitious attention to Elizabeth. As Darcy becomes more amiable, LeVasseur retains the formal and serious carriage of his character but loosens in small ways, the relaxation of a shoulder, a greater fluidity and kinder tone in speech, that let you know all that Darcy is thinking at the moment. Julianna Zinkel is a fairly carefree Elizabeth who can let a wisp of hair fall into her face or let her Regency dress hang a bit more loosely that her neater sisters, even the bookish Mary, would. Zinkel plays Elizabeth’s modesty, honesty, and sense of individuality with equal aplomb. She knows how to be the polite, sensible, well-spoken young woman Georgian society expects while being able to speak her mind convincingly and without seeming like two different characters. Zinkel provides many lovely moments, but my favorite of them is her bashfulness and abashedness when Darcy comes up her with her aunt and uncle while they are looking at his house in Pemberley. Zinkel is taken as much aback as Elizabeth is. She shows some vulnerability in her surprise to see Darcy and her feeling that she’s trespassed where she should have known better not to go. Several emotions as moods well up at once, and Zinkel is masterful as showing and defining each of them while letting them blend together. Marcia Saunders is her usual vivacious, stand-your-ground self as Mrs. Bennet. The glory of Saunders’s performance is she can let you see the relative crudeness of Mrs. Bennet while keeping the character likeable and never letting her sink into being obnoxiousness or unwelcome to the audience. On the contrary, Saunders brightens the stage each time she appears. Hanreddy and Sullivan smartly make Mrs. Bennet responsible for relaying a lot of information, and Saunders takes to the role of news spreader with great and natural alacrity. Like all in Bellomo’s cast, Saunders entertains without crossing the line into caricature. Tom Teti seems to be having a good time as the deftly sardonic Mr. Bennet, a scholarly man who is well aware of all that happens around him and who comments on it with wise and constant disdain. Teti makes the most out of all of Mr. Bennet’s retorts, not the least of which is addressed to Elizabeth when she has refused the marriage proposal of Mr. Collins, the distant Bennet relative who, by an odd entailment, stands to inherit Longborn, the Bennet home, upon Mr. Bennet’s passing. Mr. Bennet cannot always be glib or flippant. Teti shows the depth of the character at the time of a family crisis. Sentiment and self-searching join wit in that juncture of Teti’s performance, and the actor does a good job as a man beset with responsibilities he is reluctant and even feels inadequate to handle. Susan McKey and Mary McCool are each excellent in both parts they are asked to play. McKey has the right combination of style and bite as Mrs. Lucas and a perfect auntlike quality as Mrs. Gardiner. McCool shows common sense as Charlotte Lucas and is duly proud yet respectful and docile as Mrs. Reynolds, Darcy’s housekeeper at Pemberley. Robert DaPonte follows his bravura turn in Luna Theater’s “The Pillowman” with a Mr. Collins who is an object of humor but conveys the dignity and lofty status that character believes, heart and soul, he has. Hanreddy and Sullivan give Collins, and therefore DaPonte, a running gag using the word, “mortified.” DaPonte makes the most of the bit, getting a laugh each time it’s used. Best, DaPonte lets you see Collins’s servile, convention-bound nature coupled with obtuseness, an undeserved high opinion of himself, and a large swath of fickleness. Collins is the Uriah Heep (pre-Uriah Heep) of “Pride and Prejudice,” and DaPonte makes him sufficiently foolish while never losing sight of Mr. Collin’s pride and satisfaction in what he has obtained, modest though it is. Harry Smith is a dashing Mr. Wickham who never betrays shame even when his perfidy, especially as it involves Mr. Darcy, is exposed. Smith retains an innocent, urbane look no matter what befalls his character. He is unapologetic as he joins the Bennet family under questionable circumstances. He is never daunted by what people say or think of him. He’s a man who uses his good looks and easy way at conversation to survive or terms that might make others blush but are fine with him because genteel survival in his aim, at all costs. Smith plays Wickham’s amorality well. I admired the simplicity with which Mary Elizabeth Scallen played Lady Catherine de Bourgh. All of the character’s breeding and snobbery are intact, but they are part of a human package that makes Lady Catherine more conversational than authoritatively regal in her scenes with Elizabeth. Scallen’s sly control of Lady Catherine’s temper in later scenes also scores points. Marla Jurglanis’s costume were in keeping with the period and suited the individual characters. I particularly liked the black ensemble for Lady Catherine de Bourgh in the first act and the travelling clothes for Mrs. Gardiner in the second. Music by Broken Chord joins Yoshinori Tanokura’s set in providing a tone for “Pride and Prejudice.” The original score has several witty moments amid the delightful lilt of early 19th century melody. “Pride and Prejudice” runs through Sunday, March 30 at People’s Light & Theatre Company, 39 Conestoga Road (near the intersection of Routes 30 and 401), in Malvern, Pa. Showtimes are 7:30 p.m. Tuesday through Thursday, 8 p.m. Friday and Saturday, 2 p.m. Wednesday, Saturday, and Sunday, and 7 p.m. Sunday. The schedule is staggered, so call or look at People’s Light’s web site before venturing to the theater. Tickets range from$46 to $26 and can be obtained by calling 610-644-3500 or going online to www.peopleslight.org. This entry was posted on March 5, 2014 by nzoren in Theater Reviews and tagged Broken Chord, Classic, Emiley Kiser, Harry Smith, Jane Austen, Jessica Bedford, Julianna Zinkel, Marcia Saunders, Mark LeVasseur, Marla Jurglanis, Mary Elizabeth Scallen, Mary McCool, People's Light & Theatre Company, Pride and Prejudice, Robert DaPonte, Samantha Bellomo, Susan McKey, Teri Lamm, Tom Teti, Yoshinori Tanokura.